Located on the east side of Tallahassee in the Buck Lake Area, one can find the Goose Creek Neighborhoods (Goose Creek Meadows and Goose Creek Fields). This relatively new NE Tallahassee neighborhood deserves monitoring, as many boom neighborhoods are at risk of having a higher than average rate of distressed property owners. Boom neighborhoods (neighborhoods in Tallahassee that commenced sales from 2000 to 2006) are more susceptible to problems due to the number of homeowners whose move cycle will hit at the same time, and Goose Creek certainly fits this definition. 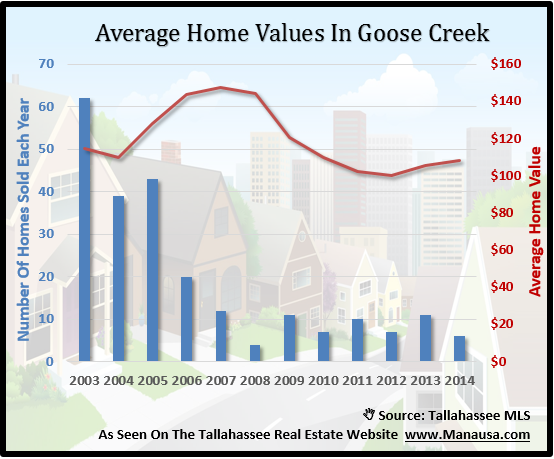 Though Goose Creek has not been one of the most active neighborhoods in Tallahassee over the past few years (like Southwood, Golden Eagle Plantation, Killearn Estates, Killearn Lakes Plantation and Bull Run), it has started the 2014 fast enough to be on our radar. Thus far in 2014, there have been 6 homes sold in Goose Creek, with an average sales price of $201,500 and a value of $108 per square foot. That means you are getting a 1,863 square foot home for just over $200K in a new NE Tallahassee neighborhood. 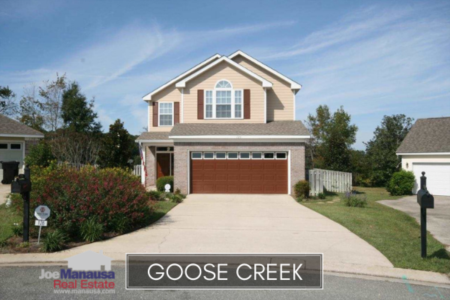 Currently, there are only 2 homes for sale in Goose Creek, which means there are buyers waiting for the next people who want to sell. There have already been six closed sales in Goose Creek this year, and as of this writing we still have a week left in the month of March. That means the first quarter of 2014 will beat all prior years going back to 2006, so homeowners in Goose Creek have reason to be excited. It is nice to see a boom neighborhood with real estate appreciation, and that is the case today in Goose Creek. Home values are up more than 8% since a market bottom was reached in 2012. 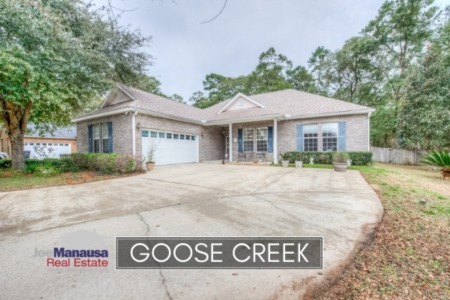 Buyers should note that the most recent listing in Goose Creek is a foreclosure (it hit the market yesterday afternoon and can be seen below), but is priced above the current home value trend. Average home prices have actually turned in the other direction in 2014, with smaller homes selling this year when compared to last year. This is not so much a trend change as it is an inventory change. When we are tracking neighborhoods with relatively few home sales, it is not uncommon to see "noise in the data." 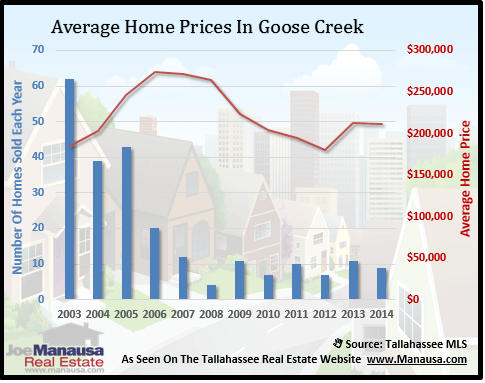 The following is a list of all homes sold in Goose Creek (recorded in the Tallahassee MLS). I hope you were able to learn something from this Goose Creek Home Sales Report, please drop me a note if you have any other questions or concerns that I can help you with.